Facing the Andes as they curve toward the southeast, Tunuyan and San Carlos have been fruit-and-vegetable farming communities going back to the 18th century. Because of the region's proximity to the mountains, the sandy and rocky top-soils are particularly shallow, well-drained, and low in fertility. Today, cool climate and low-fertility soils are considered ideal for high-quality viticulture. Water and nutrients are scarce, forcing the plant to mature slowly and to "naturally" produce a small amount of very flavorful and concentrated grapes. 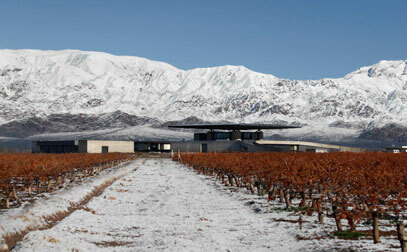 And this is exactly what we, producers of holy-grail-quality Malbec, want. The region has undergone a winery gold rush of sorts recently, with more than a half-dozen new wineries cropping up in the last decade.